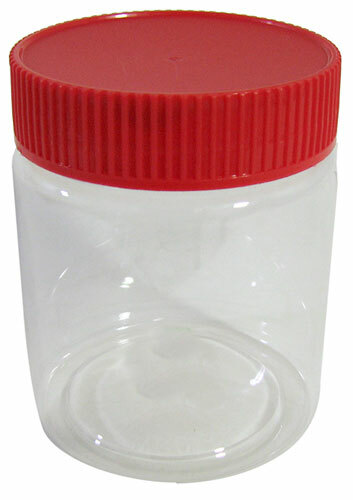 Consider our cornucopia of crystal-clear and cute capped containers. 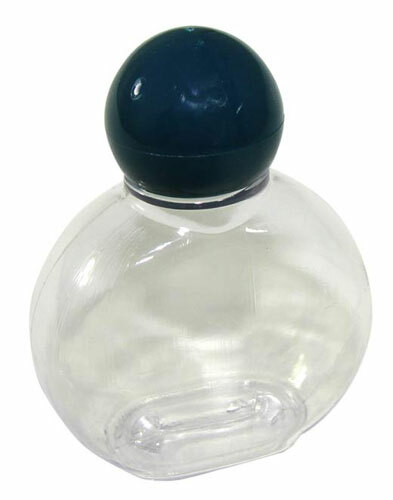 These are clear plastic HDPE in a roundish profile, 2-5/8” tall x 2-1/16” across x 7/8” thick with a 1/2" ID mouth and a spherical deep-teal gasketed screw cap They hold 1.5 oz. Reminder: These are surplus, so the color of the caps may change from one crate to the next. These clear plastic jars look like the ones that medicated lip balm comes in, but these are empty. 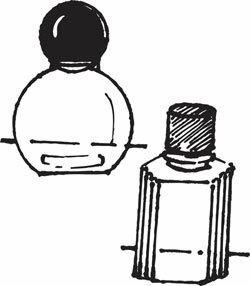 Measure approx 1-1/2” tall x 1-1/2” dia with a mating plastic screw cap, and hold 1 oz. May we suggest creating your own lip balm and saving a fortune? Also good for toting a few pills on a trip (pain relief, allergy, vitamin), and for storing glitter, and for collecting insects, and for all of the other stuff you’ll come up with. 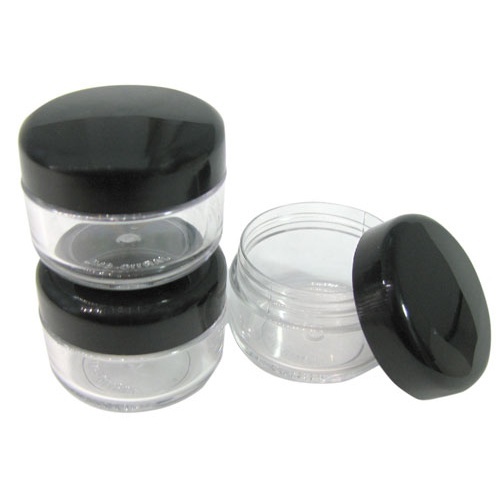 These perfect little clear-plastic canisters have snug pull-off tops. 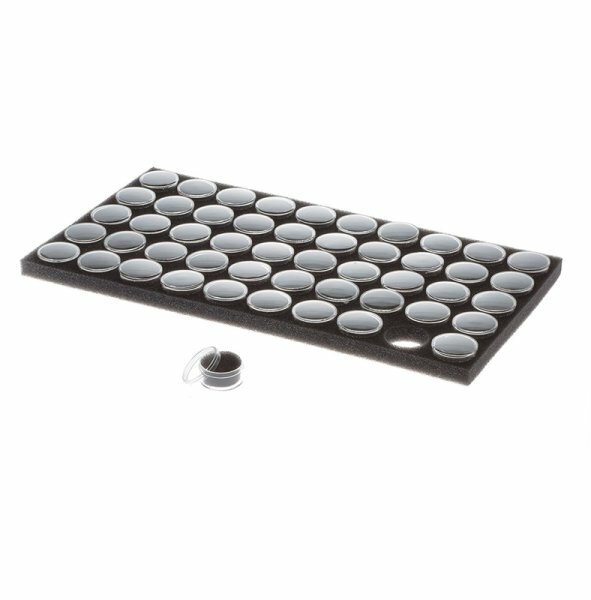 They fit into die-cut circles in a black foam pad for display or shipping, with the cut-out foam placed inside the canisters. The foam makes them ideal for safe storage and artful display of individual coins, seeds, insects, stones (precious, semi-precious, or gall-), baby teeth, locks of hair, or any number of tiny treasures. Or toss the foam and store small amounts of anything that doesn't need a screw top. You pick (50) small canisters at 1-1/4" dia x 11/16" deep, or (12) larger canisters at 1-3/4” dia x 5/8" deep. 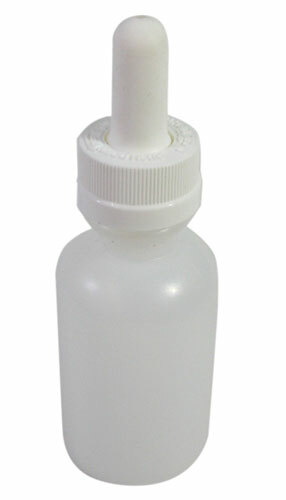 If I Could Put Glue In a Bottle Crafts and repairs are made much easier with an applicator bottle. 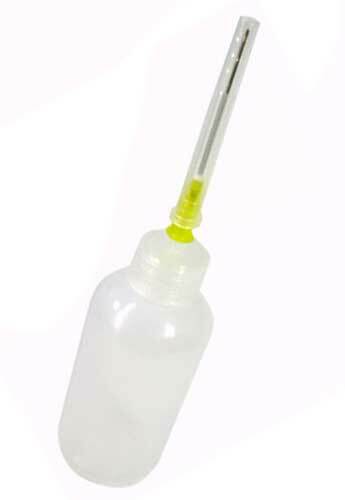 This translucent 20ml/.68-oz plastic bottle with a screw-cap that has a 1-1/2" long x 1/32" dia dispenser needle with a protective cap. 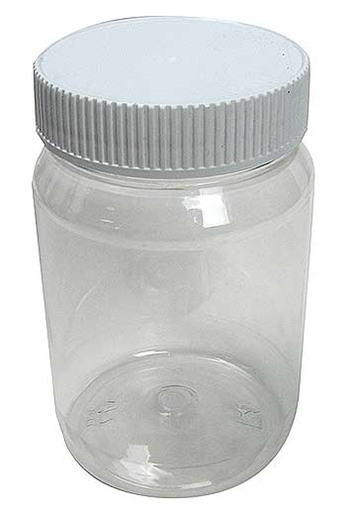 These clear plastic (PET) jars are small peanut-butter jar sized. Measure 3-5/8” tall x approx 3” dia with straight sides, and hold about 10 oz. which is roughly the same size as an 8-year old's marble collection, double the amount of coins in your car's cup holder and the ideal space to hold 17 fireflies before releasing them back into the night. Come with a gasketed red plastic screw cap. These clear plastic jars look like they used to hold food, but they didn’t. If they had, it would have been approx 14 oz of food But it wasn’t. Measure 4-7/8" x 3-1/16" dia and come with a gasketed white plastic screw cap. Made in the USA. Think lip balm, or glitter lotion. 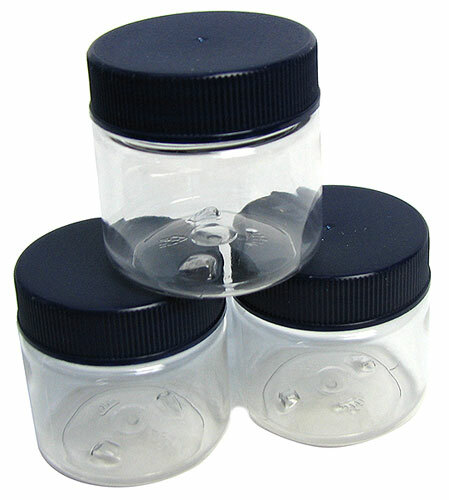 These clear plastic jars measure 1-3/16" dia x 3/4" tall with non-gasketed black plastic screw caps. Holds 6ml or 1/5 oz. Or if you're starting a collection or riding the bus, 10 U.S. quarters. Or drip some drops. These translucent white plastic (HDPE) bottles hold 50ml (1-2/3 oz) and measure 3-1/4" x 1-1/2" and come with a matching safety dropper cap that's marked for 0.4 and 0.8ml. Our each is a pack of (6) bottles so you'll have enough to drip drops through the tulips before needing to refill. 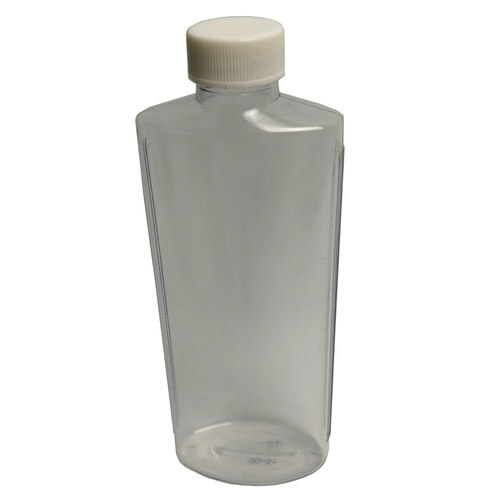 These clear plastic bottles stand 5-1/2” tall x 2-1/16” x 1-3/16” in an oval profile (make that “elliptical”) with a gasketed black screw cap and a mouth with an ID just over 1/2”. Hold approx 4 oz each. Made in USA. 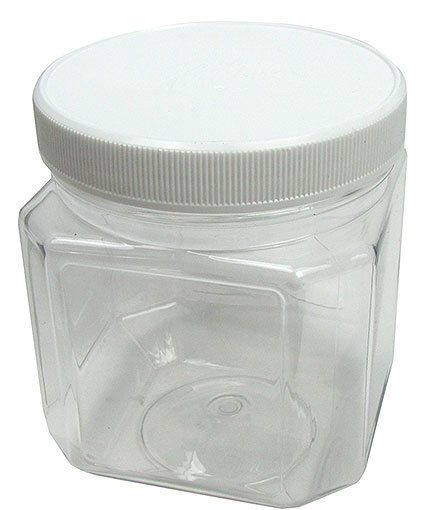 These really nice, clear plastic jars are 8-sided, with 3-1/2” sides interrupted by 1” wide corners x approx 4-1/4” tall. Great for paper clips, thumbtacks, rubber bands, decorative marbles or sand, glitter, little stickers, loose change, nails, screws and lots of other things you’ll think of. You pick: the 20-oz jars with gasketed black screw tops, or the 18-oz jars with non-gasketed white screw tops. 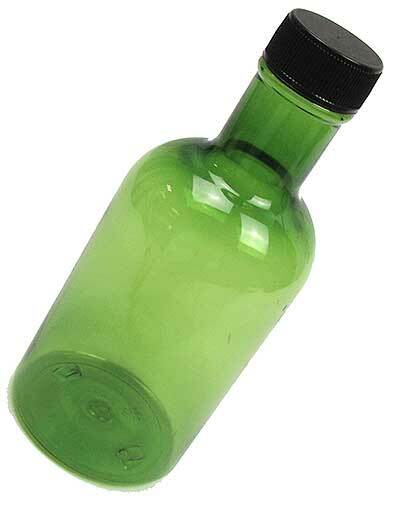 Our rare, green plastic bottle holds 10 oz, and measures 2-3/8" dia x 6” tall with a 7/8” ID mouth on top of a 1-3/4” neck. Nice, pleasing shape. Screw cap is black plastic and gasket-free. Made in USA.